Chesapeake Bay Model Racing Assoc. RULES: The regatta will be governed by The Racing Rules of Sailing 2017-2021, as amended by Appendix E for RC Sailing, prescriptions of US Sailing and further Sailing instructions as announced by the Race Director during the course of the event. Eligibility: You must be a member of the EC12 Class and Yacht must be class legal. Entry: Entries may ne submitted online as this URL: Register here. If hot link doesn't work for you, Copy and past this URL into your browser https://form.jotform.com/73534908514965 or, just mail the entry form with entry fee. Entry fee includes skipper lunch drinks during the day. 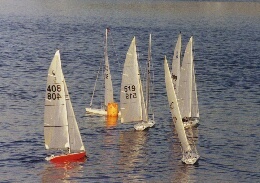 Racing format: If more than 18 Boats compete, racing will be conducted under the CESS pool system, otherwise all boats will start together. See Notice of Race for further details and schedule. As the winter sailing season comes to a close, our fleet grows to as many as twenty boats on the line. These photos were taken in Late Sept. In the background you can see the Naval Academy and the start of the AYC Frostbite series. If you are in the area please try and stop by for some racing on the Chesapeake.